News - 23 Nov `18Lectures on vitiligo in Rome: from pediatric age to pharmacoeconomics and new products. Today is the fourth Friday in the month of November. For most of the world, that doesn’t mean much. For our American readers, however, that means it’s day after Thanksgiving Day and a long weekend this year. More than 300 million people are sharing similar experience, regardless of whether they are eating turkey, falling asleep watching NFL football, looking for Black Friday deals online, or spending time with their families. There is tremendous power in shared experiences. Let me add to that experience and share some great news with you. 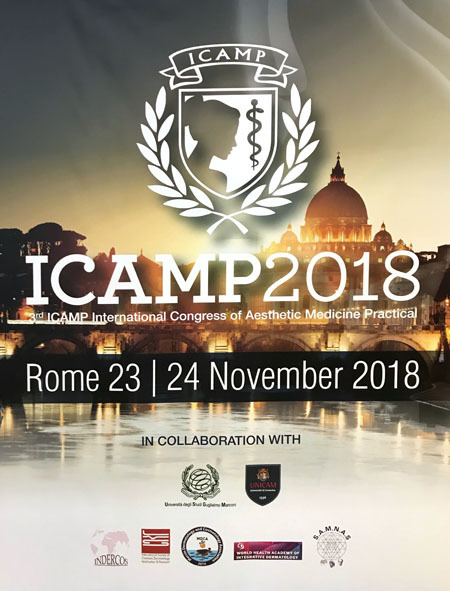 At the ICAMP congress themed "The Challenges of Aesthetic Medicine and Dermatology" we are doing a series of presentations on vitiligo and related conditions. The first lecture "Lectio Magistralis: Vitiligo" was given by Prof. Torello Lotti, MD on Friday, November 23, 2018. He discussed the latest developments in the field, including a recent exciting discovery in immunology. Other headline news: a tight connection between the gut (essentially, nutrition), moderate physical activity and inflammation in the body and skin was discussed by several speakers. A new herb-based product for vitiligo is hopefully coming to market in a matter of months. Previously unseen correlations between treatment outcomes and 40 contributing factors from our own study indicate that it takes about one year of a strict compliance to the UVB treatment protocol and costs about $5K to see positive, long-lasting results. XIII International Congress of Cosmetic Dermatology and INDRECOS Winter Forum is held under the dual presidency of Professors Pierfrancesco Morganti and Hong Duo Chen. The honorary presidium includes Profs. Torello Lotti, Maria Albini, Michelle Carruba, Katlein Franca, Sergat Inhaloz and Umit Tursen. After hours, participants were invited to visit pictresque town of Veroli by its mayor Simone Cretaro and Prof. Pierfrancesco Morganti. Home to about 20,000 inhabants, this quiet town is located approximetly 90 km to the south of Rome, and sits on a hill with a splendid view, on the site of the ancient Hernican town of Verulae. It lies off the beaten tourist path and is hardly mentioned in the travel guides, yet it contains some of the most precious relics in Italy. Venture off away from the central street and gently ask about "Fasti Veruliani," a Roman calendar from 1 a.C., that the locals keep a closely guarded secret. Tucked in between two private buildings, this may not easily be found and may not even be much to look at -- unless you realize it's tremendous historic value. This original stone calendar from the Roman Empire shows us how important was an ancient Verulae. First, a brave and proud enemy of Rome and a faithful ally, later, it still keeps many of it's secret beneath the town streets. Here are few insider tips, to help you find some of Veroli's hidden spots. In front of the city Municipo and Town Hall you'll see St. Andrea's cathedral with a basilica of Saint Maria Salome. Into the crypt, under the altar, there is a burial niche with remains of the patron of the town, the Holy Mother of the apostels Jacob the Major and John the Evangelist, sister of Virgin Mary, and witness of martyrdom of Jesus Christ. As if this wouldn't be enough for piligrims to crowd the site, this cathedral also has 12 Saint Steps, - the highiest distinction reserved only for Rome and Jerusalem. The archeological civic museum in the basemenet of the Town Hall is worth visiting for etrunian objects, bronze statues and well-preserved part of the defence wall that date back IV century B.C. A real treasure for the experts is the Giovardina Library, founded in 1773, with over 16,000 unique items - from religious writings on papyrus to early books on science. The adjacent Abbey of Casamari was started in the year 1005 by fourteen clergymen of Veroli. It has one the earliest gothic cathedrals in its purest, simplistic form, and is certainly worth your time on the way back to Rome. 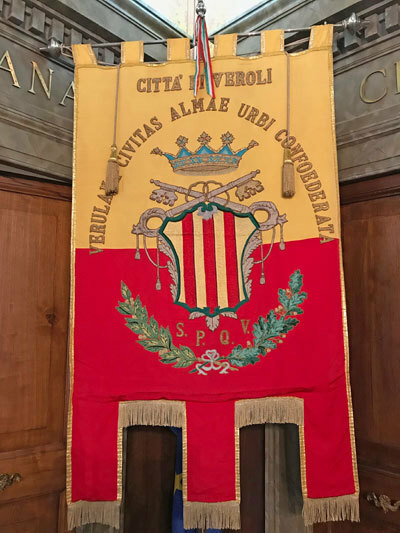 Veroli's coat of arms dates back to year 1535, a gift from bishop Quinones.